Tagline- It’s Been Six Month. Time for Your Check-Up! 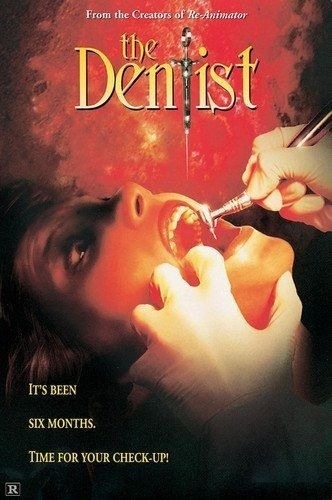 Released in 1996, on first thought most will probably write The Dentist off as just another stupid horror flick, but there is actually more here than one might expect. Obviously The Dentist isn’t a classic of the horror genre, but it wasn’t attempting to be anything more than a fun flick. But what this movie does have is a solid cast and some excellent filmmakers involved. Stuart Gordon best known for directing Re-Animator and From Beyond was one of the writers and Dennis Paoli was also one of the writers and he was also one of the writers on Re-Animator and From Beyond plus a whole slew of other Gordon flicks. Corbin Bernsen is the most notable of the cast and he’s one of my favorite actors; Bernsen is best known for his role as Arnie Becker for 8 seasons on the courtroom drama L.A. Law and Bernsen also has several films under his belt and he’s known to the modern audience for playing Henry Spencer on the USA show Psych. 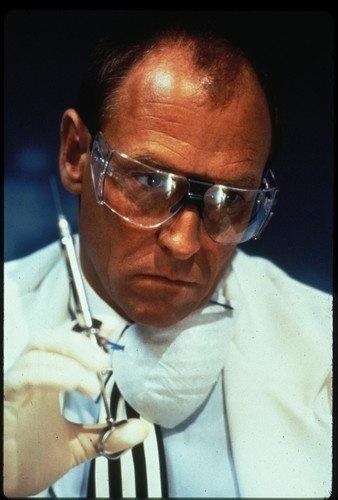 What I love about Corbin Bernsen is he’s an actor who can play dramatic roles as well as comedic roles and of course for playing sleazy type characters and hard asses, but he’s also an actor not afraid to ham it up and be a little silly and over the top like he was here in The Dentist as Dr. Alan Feinstone. The Dentist often gets mixed reviews, but sometimes I think people take the movie a little too seriously and I suppose with Stuart Gordon and Dennis Paoli involved expectations might run a little high, which is understandable based on their body of work, but if you just go in and take the movie for what it is a silly low budget horror flick you might find yourself entertained by it. 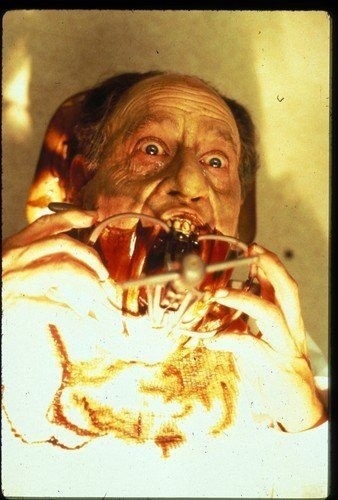 Like I said the Dentist isn’t a classic of the genre, but its a highly entertaining film. In many ways its the last of its kind as a couple of months later Scream would be released and it would totally reinvent the horror genre and low budget films like this were either getting even lower budgets or trying to copy the format of Scream. Even though the Dentist was released before Scream after what followed this film almost feels out of place. The screenplay by Dennis Paoli, Stuart Gordon & Charles Finch is what it is; it’s not meant to be a deep character study or anything like that. The script is meant to be a little silly and just entertain and I do think Paoli, Gordon & Finch succeed at doing that’ no doubt this isn’t one of Paoli’s and Gordon’s strongest work of their career, but it’s still a fun script. There isn’t much character development, but it didn’t hurt the film. Overall the script is a lot of fun and that’s all that really matters. Director Brian Yuzna from the start sets up a fun tone and while the pacing can be slightly sluggish early on its never boring and as the film goes on the pacing gets stronger. There isn’t much suspense, but Yuzna goes for a more fun tone and for the most part he succeeds. Brian Yuzna has had a bit of a weird career; he’s done some solid work like the underrated Return of the Living Dead III and two Re-Animator sequels as well as producing the first part and he was also involved as producer on Warlock & From Beyond and even was a writer on Honey, I shrunk the Kids along with Stuart Gordon, but Yuzna has also made some poor movies like the god awful Silent Night, Deadly Night 4: The Initiation and he wrote Silent Night, Deadly Night 5: The Toy Maker, which wasn’t the worst movie, but wasn’t all that good either. 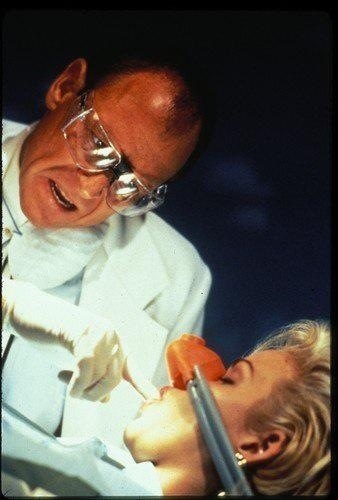 But with The Dentist, Yuzna makes a very fun movie and while I don’t think this is his best flick I think it’s one of his most fun flicks. The cast was actually pretty good something you most likely wouldn’t expect in a low budget horror picture like this and the performances were also strong. Corbin Bernsen is one of my favorite actors and he seems to having a total blast and was just wonderful. Ken Foree also stars playing a Detective, Foree of course is best known as Peter in George Romero’s Dawn of the Dead and Earl Boen also appears and he’s one of those actors you may not know his name, but once you see him you’ll know who he is. Virginya Keehne as Sarah I thought was an excellent performance; she’s playing a teenage girl who is finally gonna get her braces off after 2-years and she gives a far better performance than one might expect; while the character might lack some depth, Keehne has the awkward and shy teenage girl down to perfection. Molly Hagan and Mark Ruffalo also appear. The Dentist is by no means a masterpiece of the genre, but it’s quite a lot of fun; after a somewhat slow stat it picks up and becomes highly entertaining and was followed by an equally as fun sequel.